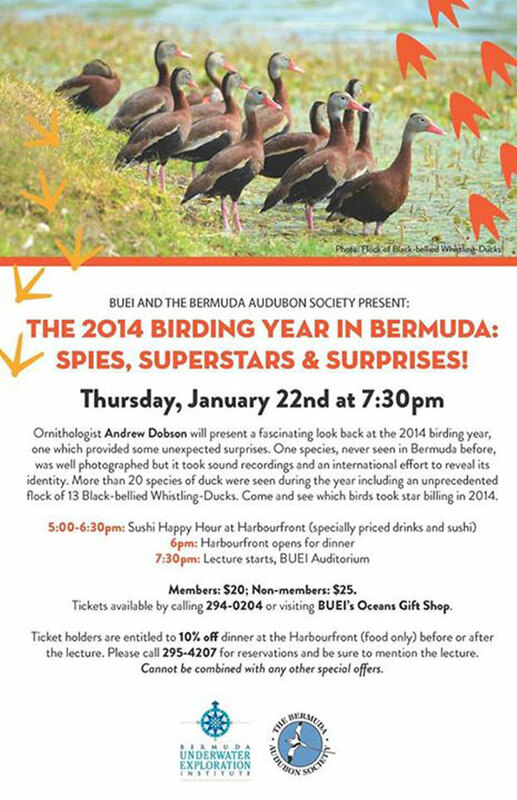 The Bermuda Underwater Exploration Institute [BUEI] and The Bermuda Audubon Society are getting set to host a lecture titled “The 2014 Birding Year in Bermuda: Spies, Superstars and Surprises” on Thursday, January 22 at 7.30pm. The event flyer says, “Ornithologist Andrew Dobson will present a fascinating look back at the 2014 birding year, one which provide some unexpected surprises. One species, never seen in Bermuda before, was well photographed but it took sound recordings and an international effort to reveal its identity. The evening will begin with a sushi happy hour at Harbourfront from 5.00pm to 6.30pm, with the Harbourfront opening for dinner at 6.00pm. The lecture will begin in the BUEI auditorium at 7.30pm. The entry fee for members is $20, while for non-members the cost is $25. Tickets are available by calling 294-0204 or visiting BUEI’s Oceans Gift Shop. However, in the interests of a more positive environment, a low key and unpublicized campaign to eradicate the menace of the marauders ought to be orchestrated, where a system of relentless trapping of starlings and sparrows is quietly put into effect. This could entail a chain of well stocked ‘aviaries’ where the sparrows and starlings drop in and stay caged until they die. Audubon should string an island wide effort to wage this war and improve bird life on Bermuda.